According to the Decree of May 1994, by the first president of the Republic State of Armenia Levon Ter-Petrosyan "On Establishment of State Commission for Organizing Events dedicated to the 80th Anniversary of the Armenian Genocide", The Armenian Genocide Museum was set up by the number 122 decision of the government of Armenia on March 7, 1995. In September 29, 1995, on the 80 anniversary of the Armenian genocide the main exhibition of the Museum-Institute was opened (Artistic development was led by architect Haykaz Qochar). The architects of the Museum are Sashur Qalashyan, Lyudmila Mkrtchyan, Arthur Tarxanyan, Sculptor Ferdinand Araqelyan). The building of the museum was state-financed, as well as was provided by the funds of Armenian General Benevolent Union and вЂњHayastanвЂќ All-Armenian Fund. The first director of the Museum was appointed Candidate of Historical Sciences, Deputy Chairman of the RA National Academy of Sciences Lavrenti Barseghyan. The Museum is included in the RA National Academy of Sciences, and has a status of research institution. This scientific and cultural institution occupies an area of 2,000 square meters. The three-stock building looks like a stone castle. On the 12 basement walls of the inner courtyard are engraved words by Henry Morgenthau, Anatol Franc, Frityof Nansen, Jak de Morgan, Valery Bryusov, Fayez El Ghuseyn, about the catastrophe of Armenian people. On the wall of the hall, is carved the map of Western Armenia with a 45-meter square, where are introduced the places of massacres and deportations. The museum is located in the south-western part of the Memorial Complex, completing already existing structures. 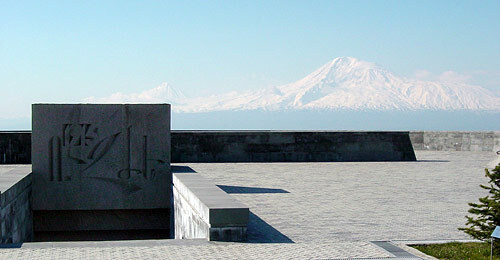 The flat roof of the museum's building is a viewpoint where a view opens up to panorama of mount Ararat and Yerevan. Within the framework of the events marking the 100th anniversary of the Armenian Genocide in 2011-2015 The reconstruction works of the memorial were held, The Tsitsernakaberd alley and the surrounding area were restored, the main building of the Museum-Institute was renovated, administrative part, the library, conference hall and archives were built. The renovation was implemented through вЂњTsitsernakaberdвЂќ charity foundation, the President of the Board of Trustees is President of the Republic of Armenia Serj Sargsyan. In April 21, 2015 official and ceremonial opening of new exhibition of Armenian Genocide Museum took place with the participation of RA President Serj Sargsyan, Members of the State Committee on Coordination of the events dedicated to the 100th anniversary of the Armenian Genocide, members of the Government and philanthropists of the museum. The architect of the Museum is Sashur Qalashyan. The new Scientific concept of three language exhibition (Armenian, Russian, English) was developed and implemented by the stuff of Armenian Genocide Museum-Institute, headed by Doctor of Historical Sciences, Director of AGMI, the secretary of the commission coordinating events dedicated to the 100th anniversary of the Armenian Genocide Hayk Demoyan. Lusine Matevosyan and Qristine Abrahamyan developed and implemented the interior design and design concept of the Museum halls. The museum expert group formed by the state committee coordinating the events dedicated to the 100th anniversary of the Armenian Genocide has provided advisory support to the works. The exhibition area of the museum was expanded by two and a half times, making 2400 square meters, has 12 halls, instead of the former three halls. The exhibition consists of 50 main headings, in which are summarized thousands of new materials acquired during the last 7-8 years' collective work. Some of them are presented as print, as well as multimedia, projectors and touch screens. Also original and unique photos, books and documents are exhibited. For the first time in Armenia, new technologies, design approaches and solutions have been widely used in the world-wide museum practice. The content of the museum exhibits, textbooks and explanations are based on scientific and methodological developments in the field of genocide science in the past few years. Over the course of more than twenty years, the museum had many visitors, including pupils, students, and thousands of tourists. The museum exhibits are provided to visitors through Armenian, Russian, English, French and German tours. The visit of the official delegations to the Republic of Armenia to the Armenian Genocide Museum is envisaged by the state order.